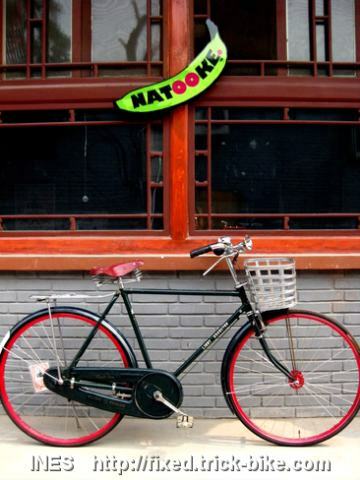 The Beijing Natooke shop has some fixed gear bikes that belong to it. This is my small pink bike that is using an old vintage Cinelli junior track frame. The front wheel is smaller so it can bar spin. It is great for doing tricks. This is my commuting and long distance blue fixed gear bike. 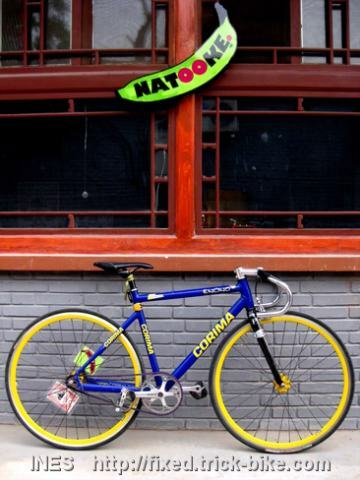 It is a Corima Track frame. It has a front brake to ensure my safety in messy city riding. This is my 100% refurbished old Tianjin Flying Pigeon single speed bike that I converted to fixed gear. Unfortunately the fork width was more narrow than the hub I wanted to use. So it does not ride so nicely free handed. But it is great for riding in rainy weather as it has fenders. This is Fede’s fixed gear conversion. He also took a Chinese Flying Pigeon. But his was a 28 inch one and he removed everything unnecessary. So it has the minimalistic fixed gear style. I think this is the cheapest fixed gear bike ever made in the world. 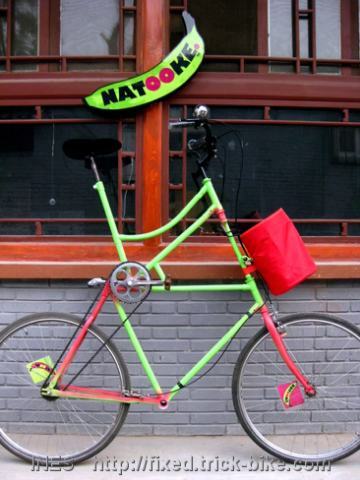 And here is the Natooke shop tall bike. 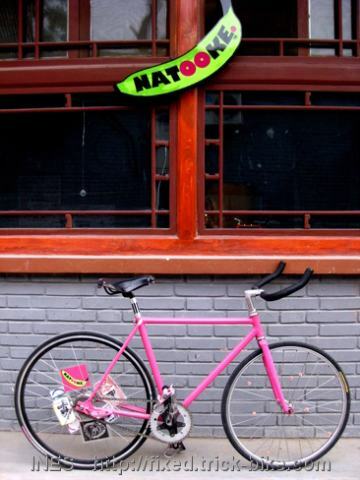 It is made from two old Chinese bikes, one a 28 inch male and the one on top a 24 inch female bike. We were thinking of having it fixed gear but we thought for riding in the daily traffic it might be better to be freewheel. But it is colored in the Natooke colors and amazes every Chinese person. 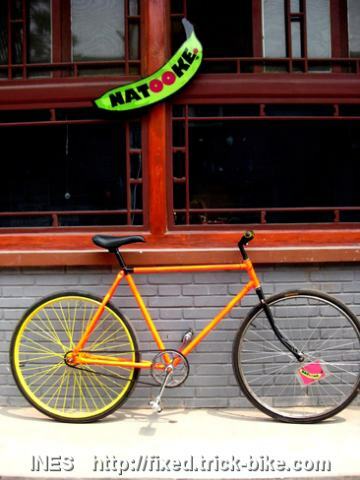 This entry was posted on Sonntag, August 23rd, 2009 at 09:23 and is filed under Asia, Beijing, China, Fixed Gear, Natooke. You can follow any responses to this entry through the RSS 2.0 feed. Both comments and pings are currently closed. Ines, I always enjoy reading your blog and gawking at all the beautiful photos. I’m curious, what kind of hub is suitable for riding no-handed that you couldn’t mount on your pigeon? Like the fixie Flying Pigeon and like the blog! Will add it to my link list on my own blog.